The arrival point for the general public is on the Homestead region of Eriador (also initially the landing point for Calas Group members, although a special group only SLurl and landmark on the Full region of Erebor will be provided to group members once the regions are fully open to the public, to help split the load). However, to avoid traffic overload, Eriador has been capped at 25 avatars at a time – so visitors are asked not to loiter / park while AFK in that region, as they could block others from gaining access. As with previous years, the main landing point sets people down close to the automated sleigh rides. These offer a choice of ride for couples or for up to four people to share, and with thoroughly recommend them, and they offer a tour of both regions, above ground and through caves, revealing all the major points of interest that can then be re-visited on foot or horseback. Simply sit in a waiting sleigh, and when ready, touch the back of the sleigh to start the ride. Just above the sleigh rides is the balloon tour pavilion, and a further enjoyable way to appreciate both regions, particularly with a friend our a loved one the couples poses make a ride very much as shared experience), while one of the horse rezzing signs can be found just beyond the hill mounting the balloon pavilion: simply click the sign and accept the horse and tail when they are offered to you. These Water Horse Bento horses have been a part of Calas Galadhon for around 18 months (they were also a part of last year’s Calas Christmas setting), and Caitlyn and I cannot rate them highly enough – if you’ve not tried them before, be sure to available yourself of them during a visit to A Might Clear, and you can read more about their presence in the Calas park lands here of the Calas park lands using them. Both the sleigh rides and the balloon tour deposit visitors up at the Calas train station, perched on the cliffs lying between both regions. Decked out for Christmas and offer warmth away from all the snow, the train offers a place to rest and enjoy refreshments before travelling onwards. Don’t expect the train to offer a ride home, however. According to the timetable, the next service out of the Calas Pavilion Station has been “cancelled until after Christmas” – and rightly so! The path down from the station is denoted by red lanterns, and offers a choice of routes down to the familiar frozen lake, where ice skating can be enjoyed, and along a snowy path to the ever-marvellous Calas Christmas Pavilion. Along the way there are plenty of opportunities to sit and simply watch all the comings and goings, and little wintertime scenes to be enjoyed. For those who missed the horses close to the main landing point, there is a further sign for them just under the railway bridge, on the path leading to (or away from, depending on your direction of travel) the main Pavilion. 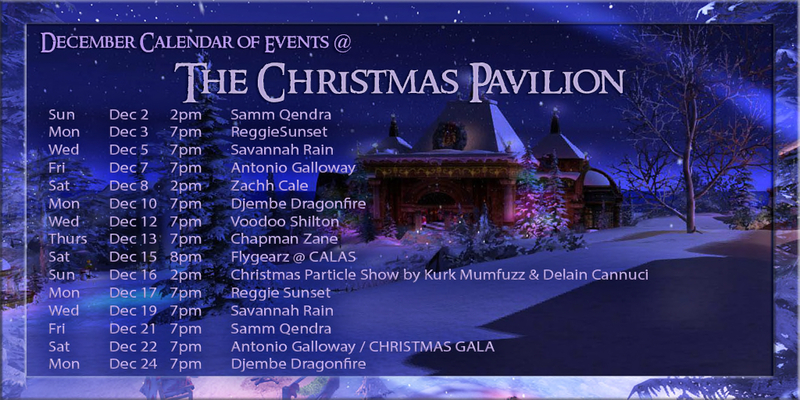 The Pavilion will be home to this year’s entertainment within the regions, as indicated by the schedule below. The Calas team always bring us visual treats to enjoy in October for Halloween and through December to the New Year, and for 2018 – the tenth year for Calas Christmas – is no exception. A Midnight Clear is visually engaging and offers a lot to enjoy when visiting. Group members should keep an eye out for the group gifts! As is my usual approach, I’ll leave you with a short video showing some highlights of the regions. I have waited all year for this. TY! It is always a delight to write about the work you all put into the Calas regions! Such a wonderful post Inara … wonderfully written , photographed .. and love the video! TY! ♥ Beautiful design, as always! Jenny and I went to Calas Galadhon’s yearly Christmas Installation. A visit there has become a tradition for us. We made the sleigh tour and we explored a bit riding a horse. The Installation is great once again and we intend to visit it a few times more during the season. As always, Inara wrote a nice blogpost about “Calas: A Christmas Midnight Clear”. Enjoy reading and enjoy your visit! Thank you, Inara!